I’m gone from GoToMeeting.com. Maybe you should be as well. It may be too late for GoToMeeting.com to learn the lessons I’ll share here, but maybe they’ll resonate with you. And save your business. I’m an early adopter – just the kind of customer GoToMeeting.com needed in early 2007. At that time, the next nearest alternative for managing architects, engineers, and contractors – what my firm excels at – was to pick up a hard copy set of paper plans, drive to their office(s), meet face to face, gather your papers, and drive back. GoToMeeting.com changed all that. At least until they changed. For those like me who needed to manage complex amounts of data and large, dispersed project teams, online meetings were game changers. I became convinced of the value and a customer, despite the fact that the annual cost came out of my personal pocket. And that leads us to lesson number one. Products or services that create value will be in demand irrespective of price (almost). I’ve been successfully using online meetings for years, turbo-charging meeting effectiveness and saving my clients (and their vendors) money by avoiding useless windshield time. It’s also been helpful bringing clients and vendors together, however far apart. I’ve used it to orchestrate projects across the country and as far away as Johor Bahru, Malaysia. I never thought to shop around. My contract renewed automatically. Thus price takes a backseat to value creation and customer satisfaction. Few consumers want to mess with something that’s working well. At least, of course, until it doesn’t. Don’t fix it if it isn’t broken. When I was part of larger corporations, it was easy to intuit the goals of any new leadership team. If company functions were spread out, then the mantra had to be consolidation. If the functions were already consolidated, the charge was to “push control back to the regions” a.k.a. disaggregation. New leadership just meant more of the same rinse-and-repeat. I imagine it’s no different in the software industry. I’m making this inference from the regular “upgrades” made to my software. While not precisely the same as the disaggregation-centralization seesaw, it shares a common inspiration: the mistaken idea that only continuous tinkering will create value. Or to say it differently, too many “upgrades” will inevitably downgrade something else – your service. At least that was my experience. One new “upgrade” downgraded the online software’s functionality and exponentially reduced its utility. My choices were to download and run a patch (the registry key) or, if that didn’t work, to upgrade my computer to something with a faster CPU, regardless of the fact that I had a nearly brand-new computer. The translation was transparent: We goofed, but it’s really not our problem. Instead it’s yours. I wasn’t considering ever changing my online meeting software. That is, until my software was “upgraded” again. I began to shop around. Keeping existing customers is always more profitable than the alternative. I’d been such a loyal customer I never knew. I never shopped around. Until the product and service started to fail. It’s easier to keep a customer than to acquire a new one – less time, less money, less effort required. Why not just keep an existing customer happy? My subscription to GoToMeeting expires at the end of the month . I will be using another company. But this is the important part: So will all my clients. While the glitch that sent me out the door is not a huge one, it was big for my business, and for the vendor to disregard it in successive upgrades speaks volumes. Why do that, especially when you are not the low-price leader? It doesn’t matter – the switch is on. Word gets around. Not only will I be using another service, but so will all my clients. Undoubtedly they’ll become comfortable with the new online provider. And by extension, the news of why I switched will get out to others. I remember the old saying, “Bad news travels fast.” I can’t imagine how much faster it travels now in the 21st century. Keepers are cheaper. Don’t give your customers a reason to leave. There is no bit of business that takes less effort to acquire than the business you already have. Simply dividing the total of your marketing and sales efforts by the number of new customers gives you the total cost for acquiring each new customer. Just for giggles, compare the quotient in the equation above with the cost of a little technical assistance or customer support. Unless and until it’s cheaper to acquire customers, companies disregard the importance of keeping existing customers at their peril. Dividing by zero. Price matters less than performance. Look at it this way: What most customers want is value. Value is the ratio of price to performance. But if performance is awful, it’s the same result as dividing by zero. It creates a meaningless and useless result. After all the effort you put into securing valuable clients, don’t disregard them. What’s my advice? Mind the store. That is, don’t lose sight of the fact that keeping existing customers happy, once you’ve gotten them, is infinitely easier and more cost-effective than acquiring new ones. “Upgrade” or fix your service offering only if it doesn’t degrade your client base. Seems like simple advice. But surprisingly often this basic principle gets overlooked. Price is not paramount. Sophisticated clients want value. They want solutions. Somewhere, way down the list, they may be interested in price. So the lesson is that customers often don’t put price first, unless something gets their attention – usually in a negative way. That’s when customers start circling the drain and start shopping. Even then, people are generally reluctant to change. You have to really want them to leave. Apply these simple principles and keep your customers – or prepare for them to become someone else’s. It doesn’t take steely nerves. Or running into burning buildings. Nor wading into treacherous rip tides. No need to leap tall buildings either. That’s the magic, the beauty and the benefit of Be The Match®. Can you believe saving a life only requires swabbing the inside of your cheek and gum with a Q-tip? Amazing, but true! Be The Match was born out of the love of parents for their daughter. Robert Graves and his wife Sherry were desperate after learning their 10-year-old daughter Laura was diagnosed with leukemia. Looking for any way to save little Laura’s life they agreed to try the first ever bone marrow transplant — from a donor that was not related. Laura received her transplant in 1979. The success of Laura’s transplant inspired the Graves, doctors and other patient families to establish a national registry of volunteers willing to donate bone marrow. Fast-forward. As of today, Be The Match has facilitated more than 61,000 transplants. Each day 17 new patients are given the gift of hope for a future. You have a chance to be someone’s miracle! Check out this inspiring story of transplant recipient Kate (also here). For transplant recipient Kate, riding a bike is not simply a leisure activity, it marked a major milestone. In March of 2009, Kate was heartbroken to learn that her follicular non-hodgkin lymphoma (FNHL) had returned. A few months later it was apparent that she would need a marrow transplant—her only option for a cure. Her brother, her only sibling, was not a match, but, thankfully, Kate’s doctors located four well matched donors on the Be The Match Registry and Kate received her life-saving transplant on June 29, 2010. Kate picked an event with a 20 mile ride and spent the next 11 months rebuilding strength. All winter she went through pulmonary therapy where she re-trained her lungs how to breathe while exercising and riding on a stationary bike. Finally, in April, Kate was able to take her new, sporty road bike out for its first road test. To celebrate, her entire family came along. “It was a family affair. I rode a mile with a top speed of 7 miles per hour. But I did it—I rode my bike,” says Kate. On race day, Kate pushed to complete the 20 mile bike ride. When she started to lose energy near the finish line, her team—full of her family and friends, did something incredible and unexpected to lift her spirits—they started singing. “My teammates had to sing me through the last mile and over the finish line. I felt an amazing and humbling sense of accomplishment and gratitude to my family and friends. I could not have done it without them,” says Kate. Since this initial achievement, Kate has taken part in a 20 mile race two more times and has improved her time by over an hour. “Not only did I accomplish something my doctors thought was impossible, cycling helped me regain my overall strength so that I can do a lot I shouldn’t be able to. Best of all, I can take care of my family which includes two busy teenage daughters and a husband who often travels. I have battled depression several times since my transplant and being able to get on my bike or exercise lifts my spirits. Cycling definitely was the key to my recovery,” says Kate. Now that you’ve read about the incredible power of this simple act, you are probably asking yourself how do I get involved? Here are two ways. You can join the Be The Match Registry. By joining the registry, you will be stepping-up to help stop blood cancers. You’ll be living proof that for thousands of critically ill blood cancer patients, there is a cure. And it could be you. Start here now. Or you could do something equally simple. I have teamed up with By The Mile for Be The Match to raise critical funds to help match volunteer marrow donors with patients who have blood cancers, like leukemia or lymphoma. This summer, I will be biking to raise money and most of all, have fun! Your contribution to my By The Mile for Be The Match campaign will help by working to add new potential marrow donors to the registry, financially supporting patients with uninsured costs and funding innovative research to improve transplant outcomes. With your help, we can do a world of good with every mile I ride. Please help me reach my fundraising goal – make your tax-deductible contribution today (here)! Either way you choose to help, you are guaranteed that you will be someone’s miracle! The Cure for Blood Cancer is in the Hands of Ordinary People – Like You and Me. I’ve signed up to participate in By The Mile for Be The Match® to raise funds to help match volunteer marrow donors with patients who have blood cancers, like leukemia or lymphoma – like Amy here. I need your help. “I’m Amy, and I’m writing today to invite you to support Be The Match® in an exciting way this summer—by participating in By The Mile for Be The Match! You see, Be The Match helped me find a marrow donor last year, giving me a second chance at life—a chance to watch my daughter grow up. A month after my transplant, when I transitioned to outpatient status, my husband, Jeff, surprised me with a beach cruiser bike! Cycling has always been a big part of our family. Jeff is an avid mountain biker—he even proposed on a bike ride! So of course, after riding the stationary bike at the hospital, the gift was such a happy surprise. 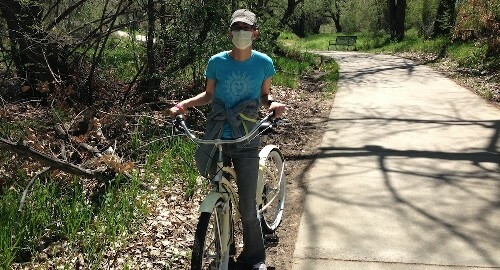 Maybe you were wondering what the woman in the mask was doing on a bike… Well, during my recovery, I lived in an apartment near the hospital and often rode the Cherry Creek Bike Trail in Denver, Colorado. I may have looked a little strange riding my bike while wearing a mask and carrying an infusion ball full of magnesium, but feeling the breeze on my face and biking to a bookstore or coffee shop—it gave meaning to my day and helped me slowly build my strength. I’ll be hitting the trails this summer to encourage my friends and family to help me raise money through By The Mile for Be The Match, and I’d love for you to join me. Most patients needing a marrow transplant need to turn to the Be The Match Registry® to find an unrelated donor. But, Be The Match doesn’t stop there. The organization also helps cover uninsured costs for patients like co-pays or transportation to and from the hospital, and they fund research projects to improve transplant success. This summer I am pledging to ride for patients in need. With your help, I’ll do a world of good with every mile I ride. By The Mile celebrates the 100-day-post-transplant milestone that is the most critical for marrow transplant patients. Once they cross the 100-day threshold, their chances of a healthy recovery increase dramatically. Thanks to your generous help, we’ll be able to continue adding new potential matches to the marrow registry, researching breakthroughs in the science of transplant, and improving care and services for post-transplant patients. With your gift, we can make more 100-day milestones possible for more patients. My goal is to raise $1,000. Can I count on your support? I invite you to contribute to my efforts by clicking “Click here to visit my personal page” and making a donation of whatever amount you can. Your donation will help patients who rely on Be The Match for a second chance at life. I’m grateful to have people like you in my life who care about making a difference. Please give today by clicking the link below to help patients find their match! Be The Match® is a global leader in bone marrow transplantation. Be The Match® conducts research to improve transplant outcomes provide support and resources for patients, and partner with a global network. Learn more. What would you think if I said that one of the project leader’s most important jobs is forecasting the future? I’m crazy? Out of touch? Yet it is absolutely true! If a project schedule is not an accurate and reliable predictive tool, then what’s the point? If a detailed project schedule isn’t used to integrate, communicate and predictably ensure the on-time, sequenced contributions of project team members, then it’s nothing more than a simple calendar – sans the scenic photos. At first pass this might sound a bit over the top, but consider this. A project schedule is to a calendar, what a thermostat is to a thermometer. One simply reports the conditions while the other acts to actually control and predict conditions. Your garden-variety project manager is charged with tracking the budget, updating the schedule, and hosting project status meetings. I would suggest that’s babysitting and not real project leadership. In the hands of a seasoned expert, the project schedule is a powerful predictive tool. It’s like a roadmap. Or a GPS navigational device. If it doesn’t help predict where you’re going, then exactly what’s the value? Much like a financial forecast, the value is not in telling you where you’ve been, but where you’re going to be. This is actionable information. Knowing where you’ll be, when you’re going to be there, and what tasks are parts of the critical path is essential to confidently arriving at your target completion date. This knowledge will empower you to make critical business decisions and course corrections before it’s too late. It’s another key element of effective project preplanning. A well honed project schedule also influences the project outcome. You may recall from previous posts, that initial conditions are always the greatest indicator of final outcome. Thus an empirically derived schedule is a powerful tool. Consider this example situation. A client came to us at the end of last year. Their challenge – and our mission – was to get their new facilities designed, engineered, permitted and constructed – as well as their personnel relocated to the new facilities – before their lease expired. There was no way to know the magnitude of this undertaking without some analysis. The first step towards influencing the project’s final outcome is to objectively observe and assess initial conditions. This is never more true that when it comes to the project schedule. The first thing to do is determine what the prospective schedule predicts. That is, when the fundamental tasks are linked in logical, predecessor-successor sequence, does that project schedule actually predict success? If you can’t make it work on paper, it’s not going to work in real-time. More importantly, the window of opportunity to make course-corrections or to take remedial steps is before the clock runs out, not after. Or to put it differently, “bad news doesn’t get better with age.” It’s better to find out now – while there is still some elbow to create new or revised schedule improvements. In the case of this client, the data suggested that they would barely make the move-in date before their lease expired. However, instead of being viewed as bad news it was correctly interpreted as predicting success – but only if we started the project rolling ASAP. One of the first steps with any project is not to just report out the “temperature”. It’s to predict the temperature and then set it at what you or your client wants it to be. YOU are the thermostat! Taking this view of the project schedule will turbocharge your ability to stay on schedule and achieve all your project milestones. So you graduated from law school. Now what? You may think that there are plenty of lucrative opportunities created by having a law degree – and general speaking you’d be right. It’s just that actually practicing law isn’t always one. If you aren’t leaping out of the starting blocks from an elite school, turning the sheepskin into cash flow is challenging. You might be better off as a barista than as a member of the bar. There is anecdotal evidence (no pun intended) that a Juris Doctorate (JD) isn’t always the springboard to upper-middle-class land. According to a quick search of indeed.com, the average California attorney makes about $53,000 per year. But before you conclude you’ve made the educational investment equivalent of buying-high and selling-low, consider just a few of the alternatives for which a JD is an advantage. A law degree makes you more versatile in the marketplace. Versatility translates into more money. It works in the business world the same way it works in sports. The greater the combination of skills, the more valued the athlete. The same principle applies to a JD – particularly when used outside of the legal field. If you can run a 4.35 second 40-yard dash, can jump over 42 inches straight-up and can leap almost 12 feet in the broad jump, you’re pretty versatile. That kind of versatility and talent translates to money. Those that can do more get paid more. A law degree makes you a more sophisticated consumer of legal services. You can speak the language of lawyers, adroitly discerning bloviating from real business. It’s a confidence booster too. I admit it. I used to be intimidated by attorneys. Maybe that describes you as well. Certainly I was respectful of the what I-didn’t-know-I-didn’t-know blind spot. The good news is that absent the fear-factor you’ll feel more empowered to speak-up as well as mix it up; all to your client’s or company’s advantage. Again, if you can do more you’ll get paid more. This point was illustrated for a client of mine recently. They were in the process of negotiating a build-to-suit agreement with a developer. The short story: Negotiations between my client and the prospective developer/landlord had slowed. The friction wasn’t necessarily about typical land development issues; storm water retention, traffic circulation, soils, available volume and pressure for fire suppression, etc. It was about responsibility for risks. Specifically, which party was responsible for issues and risks involved in the land development? On the cross-country conference call between my client’s three attorneys (they always roam in packs) and their broker, debating the options, I jumped-in. I suggested that they were looking at the issue from the wrong perspective. Whether our client, whose core business was not land development, could or should take on the various development challenges was not the question. Instead the only question was: Why weren’t we making this the responsibility of the developer through the real estate transaction? The attorney from New York released the conversational parking brake and said, “That’s right. We should make these (issues) reps [representations] and warranties.” The idea was seconded by the other pair of lawyers. The result? My client avoided hundreds of thousands – if not actually unbounded – risks and costs. If you’ll think more broadly, you’ll find that the JD multiplies the applications and advantages of your natural business acumen. A quick Google search reveals a long list of career opportunities enhanced by a legal background. In fact, it’s probably easier (and shorter) to enumerate the things that aren’t improved with a law degree. Pastry chefs could probably do without. But not if they’re opening their own business. From politicians to plumbers, a JD will help you be more effective and useful (assuming you’ll allow that using the word “politician” and “useful” in the same sentence is not an oxymoron). If gives you an advantage in almost all aspects of business. Almost all human interactions are memorialized in some fashion. Whether they’re written or unwritten. This includes rental agreements, purchase agreements, factory warranties, prenuptials, and even waivers so your kids can enjoy the local skate park or participate in organized sports. You’re probably mentally adding to this list right now. Consider the real estate industry. I can’t think of another industry so burdened by a morass of documents. All things real estate-related seem to have an agreement attached to them. Whether it’s an offer sheet, letter of intent, sale and leaseback, work letter, purchase and sale agreement easement, right-of-way, or lease agreement, the list goes on ad infinitum. A friend of mine quoted one of his professors saying, “If people fully understood the impact of taxes on their lives, that’s all they would talk about.” This is also true of contracts. In fact, the more saturated your industry is with legal agreements or attorneys the greater the advantage. Again, the point is you don’t have the practice law to get full-time, year round benefits. There’s more to it than helping yourself, you can also help your neighbor. I’m not talking about the straight ahead pro bono stuff. That’s important. But there’s more. You could teach. I did. There are a lot of people hungry for even just a little legal help. While I taught Contracts for Contractors, it could be a smaller commitment. Maybe you might help a neighbor draft a letter refuting an excessive medical bill. Or it might be providing some guidance to a single-parent navigating a Travel Consent Form. In fact, anyone that interacts with the legal system or courts could use your help. Consider CASA. Court Appointed Special Advocates (CASA) is a national association in the United States that supports and promotes court-appointed advocates for abused or neglected children in order to provide children with a safe and healthy environment in permanent homes. It’s not required that you have legal training. But it helps. Everyday opportunities to help are all around. Being more helpful feels great, and you’ll also benefit from the authentic networking that develops when you volunteer your time. If after you’ve graduated, the 80 hour work weeks and the pedestrian salary aren’t what you had envisioned, don’t worry. You’ll find that there are plenty of other opportunities to leverage your education, whether you graduated from Western State University, College of Law (my alma mater) or elsewhere. Regardless of your profession or industry, in the long run, it will pay dividends your entire career. What got me pulled into the law school wood-chipper was the need to survive in the lawyer-dominated, wireless real estate development industry. But what I got out of it was more valuable and enriching – economically and otherwise. Now, I’ll have that no-foam latte please.